This ensemble was only made for one year and it is considered rare and is hard to find. The top is a long sleeve orange vinyl bodysuit. 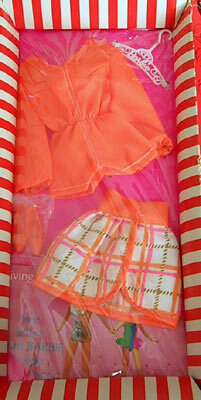 The skirt is trimmed in orange vinyl and is an orange plaid wrap mini-skirt. The vinyl top is very prone to stiffen over the years - it is very difficult to find this ensemble in mint condition.